Mario J. Giordano How to Study and Master Any Subject - Quickly! 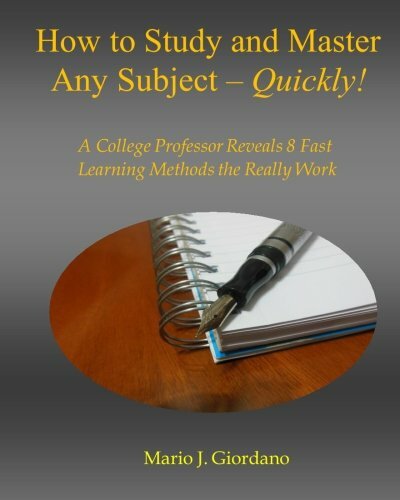 : A College Professor Reveals 8 Fast Learning Methods That Really Work! How to Study and Master Any Subject - Quickly! : A College Professor Reveals 8 Fast Learning Methods That Really Work! How to Study and Master Any Subject – Quickly! This report was written by a college professor and contains eight fast-learning methods (FLMS) that will make you a much faster learner. Whether you are a student, in the military, a professional or in any situation where studying to advance your circumstances is required, this is the book for you. By the time you finish this report, you will know: · How to remove the one major barrier to understanding. · How to quickly absorb the basics of any subject and give yourself a bedrock foundation to what you want to know. · How to make it almost impossible for anyone (even a teacher) to ask you a question you cannot answer correctly. · How to learn on your own (without classes and teachers) through a fool-proof method that has been suppressed by educators for years. · How to quickly absorb and understand whole books. · How to "lay in concrete" a full understanding of the subject you are studying through the use of simple bric-a-brac found in any home. · How to learn the secrets of acquiring quick understanding through an almost unknown use of the dictionary. · How to burn whole lists of data into your memory so that you can automatically recall them anytime. These simple methods, applied faithfully, will start you on your road to a better life.